Through my past experience with domestic violence, I used to find it hard to look at myself in the mirror. I was ashamed of what I would see. During the domestic violence I would look at myself and question who I really was. I would sit there and say to myself: “What did I do to deserve this? What is it that I am not seeing that he seems to see is a problem?” It was always me, me, and me. But the reality was it was always him, him, and him. It was never me, I was not an insecure individual, I had always been happy with who I was no matter what life seemed to hand me. It all of a sudden changed, he took that away from me, and his insecurities drowned and poisoned me, transforming me into something else. After I opened my eyes and found my escape route the shame was still there. I was ashamed that I had allowed the abuse to happen, I was ashamed that I actually accepted it as “OK”. How could I ever share my whole truth with someone? They would laugh at me. I was embarrassed. I didn’t trust anyone, I am not even sure I trusted myself. It took months, no years for me to look at myself in the mirror with confidence. It took years for my mindset to get right again, just like I wrote in my first blog about my story. Now I look in the mirror I stand before my reflection and confidently say: “Wow after all of that, I am still here, I made it out alive. After all the beating, the choking, the verbal abuse of saying I was nothing and I would be nothing. I now take this part of my life for the better good. To share with those with similar experiences, to share with those still grieving through their survival. To share for those who never made it. I am on a new journey now; I have a different destination that I am soaring too. 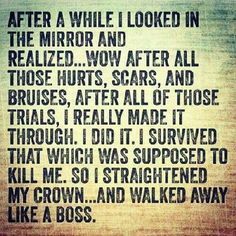 So as I prepare for each day and I look in the mirror, I smile at my reflection, straighten my crown and walk away like the boss that I know I am. As I finish writing this I am actually fighting back tears, bittersweet, because while I am able to smile at my own reflection; I know there is someone who cannot even stand their own. I know there is someone questioning themselves as I write this and as you read. For someone who feels there is no way out, know that there really is. You are loved; you are missed by those you have been taken from. You are an incredible and beautiful human being. You can do and be anything you want. You are your own property. You do not belong to anyone else. To my fellow survivors, do not give up the final fight, the final fight to stay strong; the final fight to get your identity back. That last final blow that says; “I am not broken or damaged goods, I am somebody and I will be better than I was before. Nothing and no one can stop me” Embrace your reflection, adjust your crown and take your new days head-on! Photo credit: “Domestic Violence Quotes.” Pinterest. Web. 6 Dec. 2015. .